Professional 10 Channel 4800W Powered Mixer with Built-in 24-bit FX Processor, 7-band Graphic EQ, SUB and Monitor Output ***BRAND NEW -- NEVER USED*** Very high quality Professional tremendous Power Mixer / Amp with Crystal Clear Sound quality & Ultra low Noise Amp MUSYSIC® MU-P210fx The amazing MUSYSIC MU-P210fx Powered Mixer packs tremendous power (4800 Watts PMPO), while maintaining an incredible power-to-weight ratio. These mixers employ high-efficiency technology and a state-of-the- art switch-mode power supply, which significantly reduces weight and heat. The 10-channel MU-P210fx features 10 built-in, studio-grade mic preamps, 2 stereo channels, a 24-bit DSP Multi-effects including studio-class reverbs, delays, and various multi-effects, plus a 7-band stereo graphic EQ. The MUSYSIC MU-P210fx power mixer was developed using the expertise of professional sound engineers and working musicians. 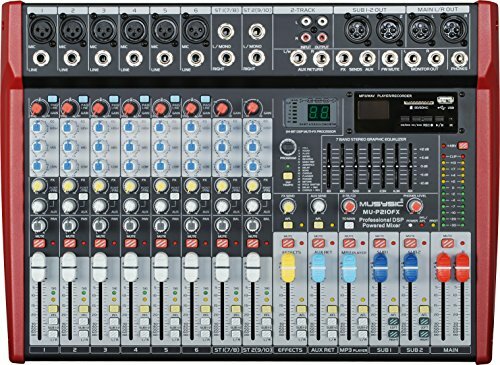 For its price range, it's rare to find a mixing console that compares with the MU-P210fx's awesome performance, flexibility and crystal clear sound quality. Build-in amplifier / 2x2400 Watts PMPO / "2x1200 Watts Program / 2x600 Watts RMS @ 2 Ohms" "2x1200 Watts PMPO / 2x600 Watts Program / 2x300 Watts RMS @ 4 Ohms" "2x600 Watts PMPO / 2x300 Watts Program / 2x150 Watts RMS @ 8 Ohms"